“Plus X Award” has a team of 26 experts from the prestigious jury, is the world’s largest coverage of the technical, sports and lifestyle related areas of the contest. In the international market, especially in the European market is highly authoritative. The Best Product 2017 and the High Quality, Design, Ease of Use, and Functionalality are recognized by Matrix S-Drive Performance Trainer. Matrix once again won the most innovative brand MOST INNOVATIVE BRAND 2017 award. This award is at the end of all product awards by the professional jury selected products won the most awards and the most innovative brands, praised the development of the brand not only to provide innovative products rich consumer life, more market to provide a variety of Choose, or even change the existing market, to create a new look! 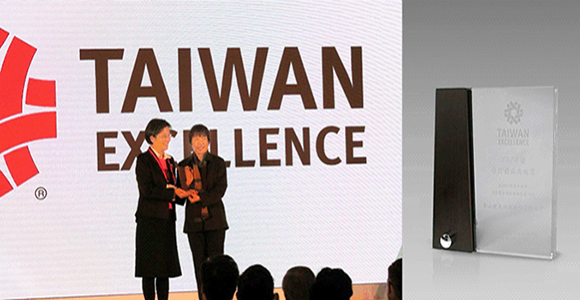 TaiSPO Awards of Excellence and Merit Award was awarded during a 4-day extravaganza trade event, Taipei International Sporting Goods Show to selected outstanding products in the sporting goods industry. An event that serves as a one-stop shop for the fitness enthusiasts and professional sports buyers to have the first-hand privilege on the latest technology in store. Johnson Health Tech is one of the 11 companies which won the TaiSPO Innovation Product 2017 – Excellence Award through Matrix S-Drive Performance Trainer. The S-Drive Performance Trainer are seen by industry experts as an advanced development trend of sports products, taking into account of its high performance. Matrix Rower get Germany’s most accredited hotel trade magazine, Top Hotel vote for the TOP HOTEL Star Award 2017 – Silver class award in Wellness category. The award was presented in 19 March 2017 in INTERNORGA Award ceremony (Germany’s largest and most professional hotel and catering trade exhibition). TOP HOTEL is a hospitality industry magazine issued by Freizeit-Verlag Landsberg, the largest hotel magazines publisher in Germany. They strive to recognize the outstanding achievements of the hotel supply industry to draw the best products for the hotel industry in 14 categories. More than 100 companies submitted their product advertising to nominate for one of the 14 categories (design, service, efficiency, food & beverage, flexibility, food concept, innovation, non-food, online, technology, usability, promotion, wellness, profitability). Only 3 products per category reached the final and were published in December 2016 magazine by the readers to vote in February. The event generate more than 4,000 public votes from readers to finally decide the 3 products in the assessment of gold, silver and bronze award. Matrix Rower unique eye-catching streamline design complemented by black and silver colours, not only complement with 5-Star hotel’s image, but also bring top level of the fitness experience to the quests. Looking at the voting activities, Matrix Rower is not only TOP HOTEL first choice rowing machine, but also have a very high popularity among public readers! JOHNSON Nest, a multifunctional foot massager won the 2017 iF Design Award; thuss become the first of the global massage goods and brands to receive a “IF Design Award” in its award history. The “iF Design Award” was founded in 1953 and is among the most prestigious and largest design competitions in the world. This award is held annually by the iF International Forum Design GmbH. About 60 considerable design-experts from over 20 countries evaluate in a fair jury process and according established criteria the award winners. Such criteria involve Innovation and Elaboration, Functionality, Aesthetics, Responsibility and Positioning. For a company, winning an IF award can be the key to break into a new market – or getting valuable media attention and respect & take it to the next level. After nearly a year of rigorous development, Johnson Health Care Co., Ltd together with U designgroup come up with the design for JOHNSON Nest. Both company collaborated and fully committed to create the most comprehensive foot massager made exclusively for the human feet. Nest Patented Industry-Leading 3D Calf Massage Mechanism supporting kneading, rolling, and shiatsu by movements of up-down, depth-shallow, different speeds. Partnering with Morinomiya University of Medical Sciences, Nest equipped a sophisticated and advanced software programs for a delicate perfect massage such as 5 Auto modes: Sleep, Energize, Toning, Reflexology, and Calf only. “iF Design Award” jury panel approval of JOHNSON Nest show legs machine is more than just a multi-functional foot massager, it was designed with consumer utmost comfort as priority which lead research and development of the exclusive innovation program. High quality aesthetic design can be perfectly integrated into the home environment. The latest research and development of the warm dust cover (Chic Pad) keeps dust and dirt out of the foot-well as well as act as a cozy blanket that keeps the user’s feet warm. The control panel situated at the upper part of the massager is intuitive and align more with the eyesight of users for a easy-to-use function. 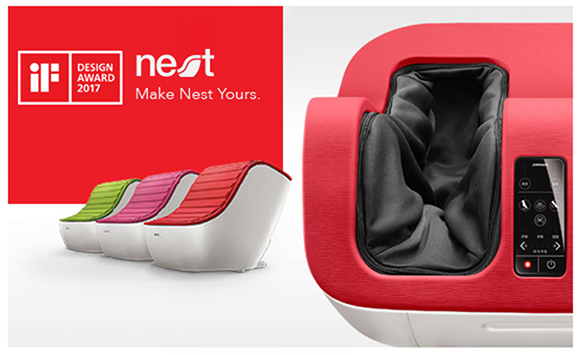 JOHNSON Nest, in addition to a sophisticated functional design, cleverly integrated into each user’s home making it more like an ideal furniture while also delivering the perfect massage. JOHNSON Nest are currently available in 59 countries worldwide this year with more than 5,500 products sold! ISPO organizers host the ISPO Global Design Award (ISPO Award) to honours the most exceptional sporting goods. A jury consisting of 49 well-known independent sports business professional from 13 different countries evaluates 540 participation entries in this year evaluation. The Health & Fitness segment only selected 5 Gold Winner Award and 6 Winer Award for the ISPO Award 2017. 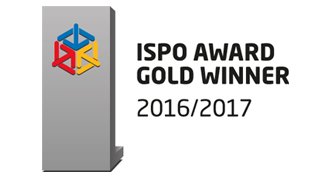 Johnson Health Tech once again stand out to achieve success with the Matrix Rower is the Gold Winner of ISPO Award 2017. Matrix Rower, a rowing strength-cardio machine, was unanimously praised: its design being highly innovative, a self-powered console offers an ultimate low-impact, full-body workout. Its smart design features a compact build, whisper-quiet operation, a smoother stroke, easy program adjustment and ten precise magnetic resistance levels. Another Johnson products, the Horizon: Bike Citta BT 5.0 is Winner of ISPO Award 2017 in the health & fitness segment. The Citta BT 5.0 is an exercise bike with innovative frame, hidden pedal crank, adjustable console, and safety design for the entire family. The combination of sports, work and leisure design, integrated table board allows you to work side by side, or use the flat screen to browse web games and other entertainment. The 25th Taiwan Excellence Award was held at the Taipei International Convention Centre on 15th February 2017 with a total of 518 companies and 1,188 products entries had joined to compete and be evaluated by 90 professional judges. 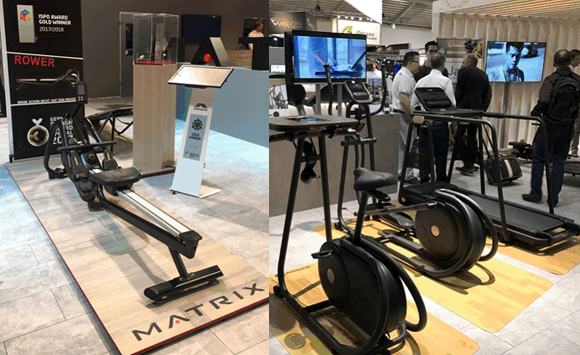 Two Johnson products, Matrix S-Drive Performance Trainer and Matrix Rower had respectively won the Taiwan Excellence Award in the Recreation and Sports industry. The intense competition estimated only a 0.2% of winning chance. With over 50 Taiwan Excellence Award won by Johnson Health Tech products from 1998-2017, a special Achievement Award was given by the Department of International Trade Taiwan Bureau with Secretary, Yang Zhenni personally hand the award at Johnson Health Tech headquarters. Johnson Health Tech is delight to announce Matrix brand had once again voted as Vendor of the Year (Best Supplier) at the Gold’s Gym India annual meeting. The award was received on behalf by CRAVATEX, Matrix India dealer. The 2017 conference was held in Hong Kong, with over 120 Gold’s Gym India franchisees participated in the vote and reaffirmed Matrix brand as one of the best fitness equipment manufacturer brand in India. S-Drive Performance Trainer, which has been well received by critics and public alike since its inception was awarded the GOOD DESIGN (G-Mark) Design Award in Japan on October 2016. 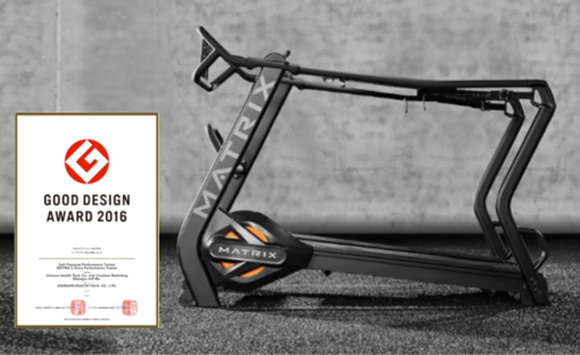 Good Design Award 2016 (Japan) marks the 4th design award win for Matrix S-Drive Performance Trainer in Y2016. Together with Red Dot Design Award (Germany), iF Design Award (Germany) and International Design Excellence Awards (USA), the product had tied down the world’s 4 major design awards, became known as “Oriental design Oscar” reputation. Critics and public also pointed out that S-Drive Performance Trainer’s self-generating system makes it different from the existing products in the industry. Matrix Retail tagline “Bring it Home” is not just all talk. The world’s fastest-growing commercial fitness brand developed a new premium collection that allows fitness enthusiasts to experience the familiar health club experience at home. FIT PROF, Fitness Professor Review had awarded Matrix Fitness as their 2017 FIT PROF Brand of the Year award. 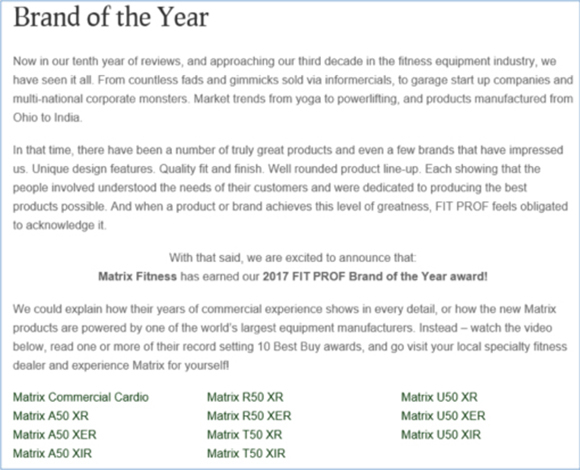 Matrix Fitness joined the FIT PROF professional evaluation for the brand of the year award, effectively won “Brand of the Year Award 2017”. Matrix Commercial is a five time winner of “Best Commercial Cardio” for its manufacturing prowess and commitment to quality for their commercial product line. Matrix Retail have a total 10 products which won FIT PROF professional evaluation for the “Best Buy Bikes, Best Buy Cardio, Best Buy Upright”.